For much of his thirties, Jesse Bering thought he was probably going to kill himself. He was a successful psychologist and writer, with books to his name and bylines in major magazines. But none of that mattered. The impulse to take his own life remained. At times it felt all but inescapable. Bering survived. And in addition to relief, the fading of his suicidal thoughts brought curiosity. Where had they come from? Would they return? Is the suicidal impulse found in other animals? Or is our vulnerability to suicide a uniquely human evolutionary development? In Suicidal, Bering answers all these questions and more, taking us through the science and psychology of suicide, revealing its cognitive secrets and the subtle tricks our minds play on us when we’re easy emotional prey. Scientific studies, personal stories, and remarkable cross-species comparisons come together to help readers critically analyze their own doomsday thoughts while gaining broad insight into a problem that, tragically, will most likely touch all of us at some point in our lives. But while the subject is certainly a heavy one, Bering’s touch is light. Having been through this himself, he knows that sometimes the most effective response to our darkest moments is a gentle humor, one that, while not denying the seriousness of suffering, at the same time acknowledges our complicated, flawed, and yet precious existence. Authoritative, accessible, personal, profound—there’s never been a book on suicide like this. It will help you understand yourself and your loved ones, and it will change the way you think about this most vexing of human problems. "What undergirds Bering's inquiry is the belief that locating the psychological blunders that lead to suicide can help, in time, to curb their prevalence." "He weaves together personal stories, delves into whether nonhuman animals die by suicide, and examines the relation of religion and self-killing. These angles offer a critical perspective on a devastating problem." "Suicide is one of the toughest subjects to write about, and psychologist Jesse Bering does it with candor, scientific integrity and genuine empathy in Suicidal. . . . The book itself is a testament to the human spirit. Researching and writing the book, he says, was a way to combat suicidal ideation and give his own life a renewed sense of purpose. . . . Suicidal is a vital book--informative, engaging, and enlightening despite its dark subject matter." "Jesse Bering is the best science writer at work today." "By the time you finish reading these sentences someone in the world will have committed suicide. Why do more than a million people a year kill themselves? To answer this question we need a brilliant research scientist, an insightful psychologist, and a sensitive but powerful writer who has seriously contemplated taking their own life. Jesse Bering fits all three criteria and the book you hold in your hands is a deeply moving narrative that cuts to the heart of the ultimate question any of us could ever ask: why should I live? 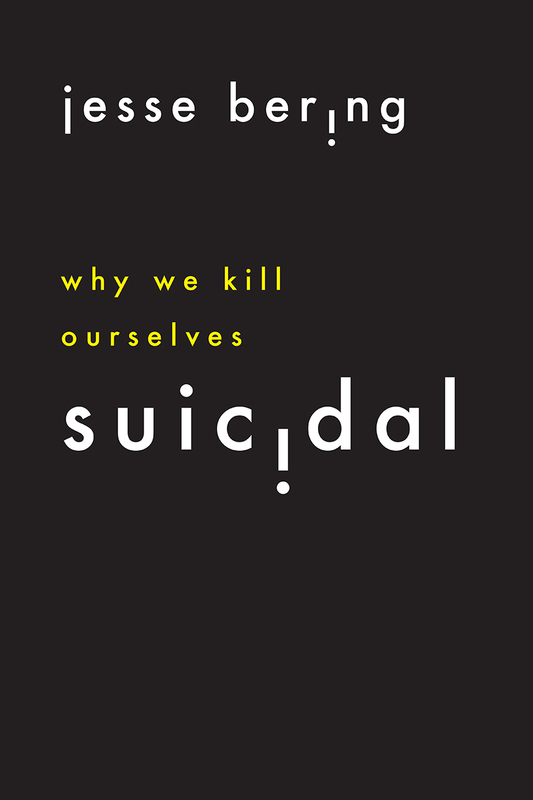 Given what’s at stake in the topic, Suicidal may very well be the most important book you will ever read." "I'm not surprised that a book on suicide would be very personal, but I didn’t expect it to be so damn funny. It's also engaging, thoughtful, and sensitive--although Bering is certainly irreverent, there is a real appreciation of how painful and difficult this topic can be. This is a book for scholars and for a general audience, but it is also entirely suitable for people whose lives have been touched by the suicide of someone they loved." "In Suicidal, Jesse Bering explores one of the most essential questions we all face: Why keep living? He doesn't claim to have found any easy answers, but his exploration is surprising, funny, touching, and deeply personal. Suicidal feels like a gift, and reading it reminded me that encounters with great books are reason enough, for now, to keep going." "I have yet to come away from reading one of [Bering's] essays and not feel considerably better informed than I was just minutes before."